Three players will represent the Milwaukee Brewers at the 2018 MLB All-Star game — with a chance to add a fourth. 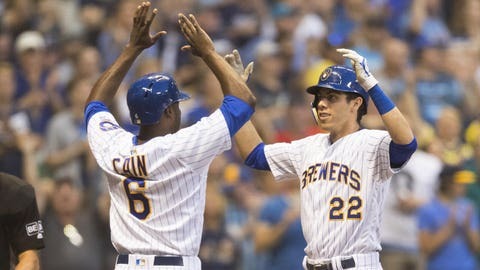 Reliever Josh Hader and outfielders Christian Yelich and Lorenzo Cain are headed to the midsummer classic, hosted by the Washington Nationals on July 17 at Nationals Park. First baseman Jesus Aguilar, who leads the National League with 22 homers, was named one of five players to compete in a final vote for the NL’s last roster spot. In 44 2/3 innings of work, Hader has fanned 83 hitters, leading all relievers across MLB. He’s allowed just six earned runs all season and owns a 1.21 ERA and a 2-0 record. It will be the second career appearance in the midsummer classic for Cain, who was also voted to the game in 2015 with Kansas City. The 32-year-old, acquired in free agency by Milwaukee this offseason, has registered 15 doubles, eight homers, 26 RBI and a .291/.394/.438 slash line in 72 games this season. Yelich has starred in the outfield for Milwaukee this season as well. The 26-year-old owns a .282/.358/.458 slash line with 12 doubles, 11 homers and 35 RBI in 73 games. It will be the first All-Star appearance for Yelich, who has won a Gold Glove and Silver Slugger award in his young career. In 78 games this season, Aguilar has a career-best .303/.364/.610 slash line with 22 homers, 14 doubles and 62 RBI. San Francisco first baseman Brandon Belt, St. Louis infielder Matt Carpenter, LA Dodgers infielder Max Muncy and Washington shortstop Trea Turner are the other four players battling for the final vote. To help Aguilar get to D.C., fans can vote by following this link.